After spotting this little Frenchie puppy on Knox street, I parked my car and chased after the man with a puppy. 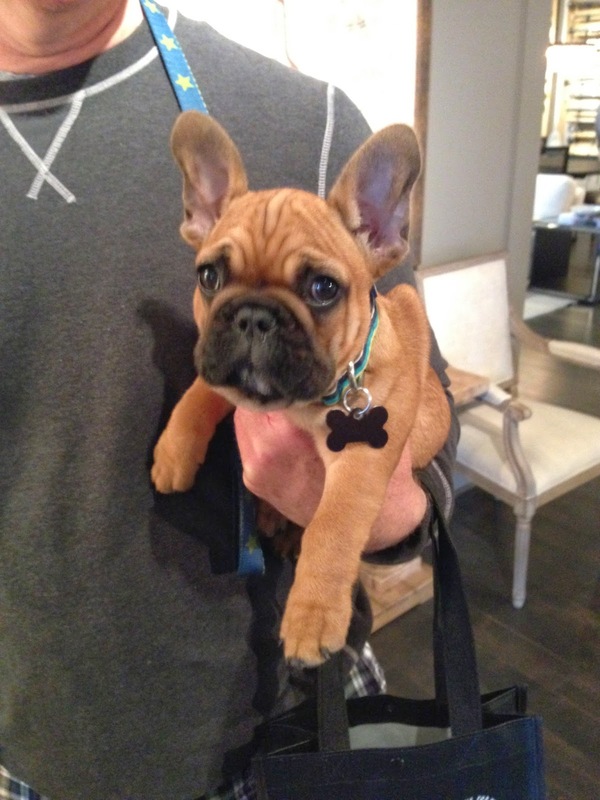 I followed him into Restoration Hardware. Once inside, I corned the man with a puppy and told him I have had two Frencies in my life (he said: "lucky you") but Martha Fauker was 5 years old when I adopted her, and Sarah Dooley was 16 weeks old when we adopted her. I've never seen a Frenchie so young in person. He said his boy was 10 weeks and 2 days old. He let me pet the little guy and he let me snap this photo. He was walking out of Restoration Hardware as I was pulling up photos of Dooley on my phone. He said she was beautiful. (Obviously.) And then he left. I might have scared him away. It was worth it. Apparently I'm a little aggressive when I spot a Frenchie puppy. So much cuteness in that picture! Dooley is still the cutest ever!! !